These are not good times at conservative idea factories and their advocacy affiliates. They were humbled when Social Security privatization bit the dust. They were crushed when they lost the Dover, Pennsylvania intelligent design case. And now the Florida Supreme Court, bless them once again, has struck down Jeb Bush's signature school voucher plan. But how are parents supposed to discover good schools in the absence of any reliable, systematic source of information about them? How are the rest of us supposed to judge whether the experiment is working or not in the absence of any data? ... One of the great unresolved contradictions in the conservative movement's advocacy on education is the extent to which it is demanding that public schools adhere to rigid testing requirements under the No Child Left Behind Act while simultaneously promoting voucher systems that require no reporting at all from private schools about their performance. If you want to know why the economy feels kind of lousy even though the nation's journalists keep telling us everything is peachy, EPI explains it all here. The short answer is that although the headline numbers of growth and productivity are healthy, this growth isn't benefiting actual workers: hourly wages are down, household income is down, debt is at historic highs, the personal savings rate is now negative, job creation is sluggish, poverty is up, and the number of people without health insurance is rising. Now that such whited sepulchers as Newt Gingrich have denounced the betrayal of the Republican revolution and the evils of congressional corruption, what more can be said about Jack Abramoff, Ralph Reed, Tom DeLay and all the other politicians, operatives and bagmen implicated in their schemes? Perhaps it is worth expressing a small hope that the good religious people of this country will rise up in outrage against the abuse of their faith by all these pious hypocrites. Rarely has the contrast between the rhetoric of the religious right and the behavior of its leaders been so starkly exposed as in the Abramoff scandal. The most obvious example was the manipulation of Christian activists in Louisiana and Texas by Ralph Reed, former executive director of the Christian Coalition, who said he was helping them fight gambling when he was actually using them to promote Indian casinos (and to make a few million bucks for himself). David Brooks slaps his own party around in today’s New York Times. I don't know what's more pathetic, Jack Abramoff's sleaze or Republican paralysis in the face of it. Abramoff walks out of a D.C. courthouse in his pseudo-Hasidic homburg, and all that leading Republicans can do is promise to return his money and remind everyone that some Democrats are involved in the scandal, too. That's a great G.O.P. talking point: some Democrats are so sleazy, they get involved with the likes of us. There's bound to be corruption when members are forced to vote on sprawling bills nobody has a chance to inspect. Instead, all legislation should be posted online for 72 hours before the vote, so the staff and bloggers can nitpick and expose. He also says that they should fire Congressman Bob Ney as chairman of the House Administration Committee immediately. For God's sake, Republicans, show a little moral revulsion. Back in the dim recesses of my mind, I remember a party that thought of itself as a reform, or even a revolutionary movement. That party used to be known as the Republican Party. I wonder if it still exists. Answer: No, it does not, if it ever did. I certainly hope that the GOP leadership will ignore Brooks’ advice and dismiss this column outright. Today everyone is rightfully upset over the emotional rollercoaster that the families of the Sago mining disaster victims were put through last night. Our 24-hour, you-are-there-when-it-happens news culture spread the mistaken belief that 12 of the 13 miners survived the disaster all over the country before it was confirmed that only one survivor was found. But what should upset people even more is the way the Bush administration has neglected coal mining safety in recent years. Federal authorities issued 21 citations last year for a build-up of combustible materials at the West Virginia mine where 12 men died, according to U.S. Labor Department statistics. And yet these citations were ignored. Why? Because they had no teeth. ...penalties for OSHA or MSHA violations remain laughably low. The highest penalty of the more than 200 citations received last year by the Sago mine was $878. But that was the exception. Most of the others were $250 or $60. At that rate, it’s hardly a good business decision to even bother fixing anything. Meanwhile, it is amazing that these mines still get inspected at all considering the political climate in Washington these days. According to an AFL-CIO analysis, the Bush administration cut 170 positions from federal Mine Safety and Health Administration (MSHA) and has not proposed a single new mine-safety standard or rule during its tenure. Then, of course, there is the inevitable Republican cronyism - a Bush administration specialty! Last September, Bush rewarded the coal industry by placing coal industry veteran Richard Stickler in charge of MSHA. Stickler spent about 30 years as a coal company manager with Beth Energy. Mines managed by Stickler were marked by worker injury rates that were double the national average, according to government data cited by the United Mine Workers union. The mining explosion should call attention to the Bush administration’s inadequate enforcement of federal mining safety regulations. Mining safety in the U.S. has improved dramatically since the Mining Safety and Health Act was signed in 1977. By the time that President Clinton signed the International Labor Organization’s Convention 176 concerning safety and health in mines, mining deaths dropped from 425 in 1970 to 85 in 2000. But then West Virginia coal firms raised $275,000 for Bush/Cheney, and since then the citations for safety violations have become meaningless. Hmmmmmm. Enforcing the laws. Kind of like upholding the Constitution. That is not something that this administration is particularly good at. Abramoff raised at least $100,000 for the Bush-Cheney '04 re-election campaign, earning the honorary title "pioneer" from the campaign. But the campaign is giving up only $6,000 directly from Abramoff, his wife and one of the Indian tribes that he worked to win influence for in Washington. The money is being donated to the American Heart Association. The crime isn’t that people got money from Abramoff. It is what they did after they got the money - the quid pro quo. That is what Abramoff will be testifying about in his plea agreement. Giving 6 percent of the money to some random charity is just a desperate, last-ditch PR move. President Bush gets a lot of credit from his GOP apologists for spreading freedom and democracy across Iraq. But how much of that is really deserved? The other day the Washington Post broke the news that the Bush administration is not planning to seek any more reconstruction funds for Iraq. So that means we are done, right? Mission Accomplished!! Or is it? “U.S. allies have fulfilled about $3.1 billion of the $13.6 billion they pledged at a donor conference in Madrid shortly after the 2003 U.S.-led invasion. It is unclear when - or if - the rest will be provided. An October 2003 World Bank study estimated that as much as $60 billion would be needed to rebuild Iraq, far more than has been pledged or delivered. So if we just leave this problem to fester it will probably lead to civil unrest that will probably tear apart the fledgling government and lead to civil war. Now, obviously, I’m one who did not want to go into Iraq in the first place and I have advocated pulling our troops out sooner than later. But President Bush is the one who has insisted that setting up a stable government in Iraq was the reason we toppled Saddam in the first place. Is he really serious about achieving that goal? I’m beginning to doubt it. I guess it is one thing to ask our troops to go overseas and lay down their lives on behalf of some right-wing, neo-con fantasy. But asking U.S. taxpayers to sacrifice by perhaps raising their taxes to fund a $60 billion reconstruction program? Not on your life! If Bush was really and truly committed to his stated goal of turning Iraq into a model of Western-style democracy, he would have gone before the U.S. people and told us that it is now our turn to sacrifice the way our soldiers have by opening our wallets to support the ongoing works that must be completed to get Iraq to where it needs to be. But apparently, that is asking too much. In the end, the only thing that matters to Republicans is tax cuts for the rich. Everything else is just pie in the sky flapping of their gums with no real substance to back it up. And they are just counting on the rest of us not to notice. 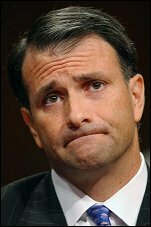 Washington lobbyist Jack Abramoff has reached an agreement with federal prosecutors to plead guilty to two criminal charges stemming from the 2000 purchase of a fleet of gambling boats, his attorney said Tuesday. Abramoff will also agree to cooperate in any ongoing federal investigations in Washington, said his Miami attorney Neal Sonnett. Prosecutors there are investigating several members of Congress who allegedly received favors from Abramoff or his clients. Can Tom DeLay’s second indictment be far behind? I didn't see many movies that came out in 2005, and it will be sometime before I get to see movies that are coming out in 2006. Still, I'm excited about some of the big movies I've heard about. Cars - The latest from Pixar. The DaVinci Code - I've never read the book and have only the vaguest notion of what it is about, but I figure with Ron Howard directing and Tom Hanks starring you can't go wrong. Mission Impossible III - I own the first two on video tape. Tom Cruise may be kind of loopy in his personal life these days, but he is still an excellent actor. Casino Royale - The latest James Bond movie with the new blonde guy in the starring role after they cast off Pierce Brosnan. Superman Returns - Will this be in the same league with Spider Man and Batman (or the X-Men) Or will it miss the boat and end up in the drink with the likes of The Hulk and Daredevil? Sicko - The latest by Michael Moore which turns out to be a documentary that goes after the health care industry. Apocalypto - The lastest from Mel "Passion of the Christ" Gibson. (Untitled 9-11 movie) by Oliver Stone and starring Nicolas Cage as one of the New York cops who survived the collapse of the first Trade Tower. Pirates of the Caribbean II - No surprise that they made a sequel here (I understand they have already started a third as well) and it looks like the original cast is all on board. It didn't feel like New Year's today, mainly because there was no Rose Bowl Parade (they bumped it to tomorrow) and also because it was 75 degrees outside. San Antonio has had a really mild winter so far. 2005 had a lot of problems. Lots of natural and man-made disasters like the Indonesian Tsunami, Hurricane Katrina and the second inauguration of President Bush. Then there have been countless scandals percolating up from this incompetent administration including the CIA leak that outed Valerie Plame; the corruption swirling around top GOP lobbyist Jack Abramoff; and the indictment of former House Majority Leader Tom DeLay. But none of this took away from the joy my family experienced with the birth of our daughter Isabel in November. Now just over a month old, she is a delight and her big brother Nathan is adjusting well to his new role in the family. The whole year seemed to just fly right by for me (although I imagine that it probably dragged a bit more for my wife who spent most of that time pregnant).